Back in 2004, a startup science fiction and fantasy magazine called Orbital was looking for contributors. I was a student, I signed up, and the first thing I wrote was based on an interview with Susanna Clarke. Sadly, Orbital failed to launch. I found other outlets for the interview, in student newspapers. "I think my expectations were pretty low. I’d never completed a novel before." Well, for a writer whose Booker-Prize-longlisted novel is getting book collectors and investors so excited that one edition shot up in value from £30 to £300 within days of being published, Susanna Clarke is quite modest. Her novel, Jonathan Strange & Mr Norrell, has been compared to the works of Tolkien. It has been compared to Harry Potter. It has been compared to anything and everything successful in the fantasy market. And, of course, most of these comparisons are quite wrong: This book is rather unique. She explains: "I tried to make that as accurate as I can, a sort of blend to ground the magic. I find that magic becomes more believable when you put it next to something which is quite mundane, and quite ordinary." Mundane and ordinary? Certainly not the words I would use to describe her story. Let’s begin by describing the premise: At the start of the nineteenth century, British magic is in decline. It is strictly a theoretical science, with no practical application - like advanced maths with a twist. Two magicians aim to reverse all of that, to revive the ancient art of English practical magic. These two magicians are Mr Norrell, a paranoid eccentric, and Jonathan Strange, an adventurous younger man. 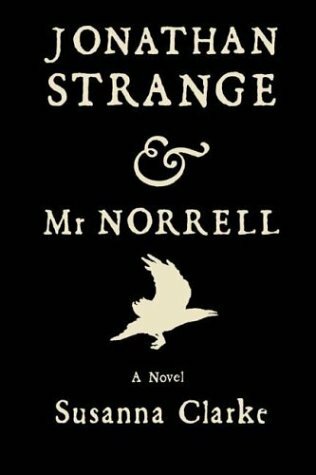 Mr Norrell brings his magical abilities to public attention and proposes to help out in the war against Napoleon. And so their adventures begin. It is perhaps the notion of magicians that causes a lot of the comparisons. Any newcomer has Harry Potter, Dumbledore and Gandalf to measure up against. Jonathan Strange and Mr Norrell are quite a different breed. They don’t grow long white beards. They don’t wave around any wands. Neither of them could be described as being particularly wise. In short, they aren’t the archetypes we are used to. Mr Norrell is studious, but paranoid. Strange is adventurous, but easily distracted. These literary magicians are amply supplied with flaws, depth and individuality. But to focus on just the two magicians is to do this story a great injustice. There are fascinating and enchanting characters aplenty. We meet ministers and prophets, wives and servants, fairies and generals. Indeed, the struggles of servants and wives are probably easiest to identify with. And their struggles are dominated by the time they live in: "It is a male book, because it’s... it’s this thing about being accurate. Women were not powerless in the regency period. But the world of action belonged very much to men." Susanna Clarke certainly takes realism quite far: Places are accurate, historical events are correctly portrayed, and even real life historical people turn up. The Duke of Wellington appears to have seriously caught the author’s fancy: "When I researched him, I just got more and more entranced by him. He just continually formed himself into the person he wanted to be. He turned the army into the army that could do it (beat Napoleon), and himself into the general that command that army. And that is impressive. Plus, he was very witty, and always wore cool clothes." Reading this novel is quite a delightful experience. It starts out playful and witty. It’s the written equivalent of a comfortable stroll in a beautiful, enchanted landscape. A few hundred pages later, it is a tale of magical adventures in the war against Napoleon. And yet another few hundred pages later, the story becomes much darker, almost heartbreaking. I found it impossible not to connect and identify with the characters. So, how does one go about writing a story like this? Does Susanna Clarke have any hints for aspiring writers? "My world is publishing, where lots of well-read people would read lots and lots of novels, and I would read the comics of Alan Moore... and I couldn’t talk to anyone about that because that was completely... out-of-field. But nevertheless, it’s fed my writing. So I would say to go with your own taste is the important thing." In that case, I can’t insist that you go out and buy this book. Just be aware that there is a very enchanting novel out there, full of beautiful, witty prose and delightful characters for any reader. It’s not like Tolkien or Rowling or Feist. It’s a different beast, and I am glad it has been discovered.